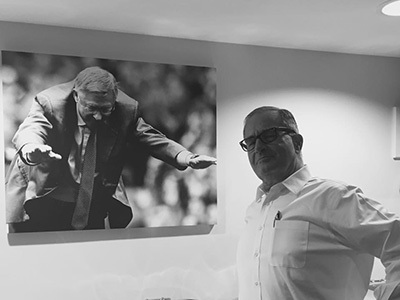 “It was a great pleasure to attend the Roadshow and connect with so many managers who are all striving to achieve great things for their club. The 59club team were as passionate as ever demonstrating their enthusiasm to drive the industry forward. As a Club Manager their sales & service process will assist us at Formby to advance by fine-tuning our own delivery. I encourage fellow BIGGA members to take notice of what 59club are doing within our Industry and how their measurement tools & service principals can assist us all to do ”. 59club Director, Mark Reed is back from his Tour of the UAE where he has been busy corrupting the teams at Dubai Golf & Yas Links empowering them to convert more member sales and retain more club members. Training has focused on the exact same ‘59club membership sales procedures’ that assisted one of the largest golf group in the UK increase their membership sales performance by 77% in year 1, and 90% in year 4. Yas Links is fairly new to 59club after calling on their expertise last year, but the teams wasted no time in getting to grips with the 59club sales and service principals. Howie Roberts, Yas Links General Manager was quick to acknowledge the positive impact that 59club has had on staff performance and the way he manages his business when it comes to visiting golfers, members and prospective members. “I am confident that when a golfer visits Yas Links that everything we do has been carefully planned, that the service we offer is guaranteed and that when it comes to our bottom line we are doing well. 59club has assisted us to breakdown the customer journey and scrutinise the minuscule to make a big impact. Marks training day with the team put the icing on the cake for us, he gave them new focus, ignited the fire in their bellies and has given them new direction and a process that we now need to follow in order to excel. We are already looking forward to Marks return trip as we constantly strive to do better”. 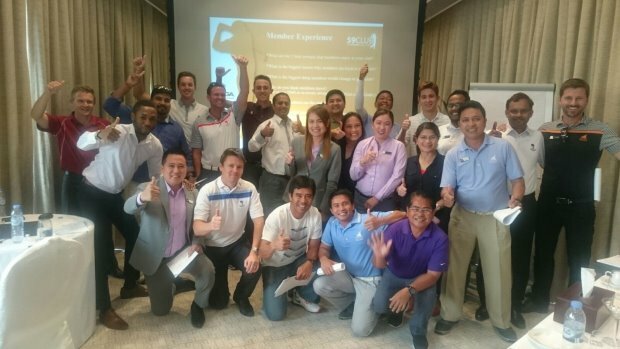 The team at Dubai Golf have worked with 59club to develop their sales performance & service etiquette for the past 5years where both The Emirates Golf Club & Dubai Creek Golf & Yacht Club as a result are witnessing some of the best membership conversion and retention rates that the group has ever seen. Chris May, Dubai Golf CEO said “Having Mark deliver the training to the team has given them a heightened perspective of the standards that we expect from our staff and the service that our members and guests deserve. It’s truly inspirational to see Marks passion and vision for wanting to create the best experience for our members from the very moment they join. The team are literally buzzing and can’t wait to incorporate 59clubs sales and service tactics into ‘club life’. 59club Director Mark Reed added, “When members choose to join these forward thinking clubs, reassuringly they will never be treated like ‘a number’. These clubs work hard to assist members integrate into club life and guarantee to make their life as a member experience the very best”. Dubai Golf famously collected the ‘Golf Group of the year’ Award at the 2016 ‘59club Sales & Service Awards Ceremony’ famously regarded as the ‘Oscars’ of the golf industry. The Creek was honoured with the ‘Ultimate Golf Members Award’ and The Emirates went on to collect the 59club Gold Flag Award, further demonstrating the groups commitment to providing the best experience for visiting golfers and their members who are lucky enough to call Dubai Golf their club! 59clubs UK ‘Sales, Service and Retention Roadshow’, coming to a club near you, takes place between the 5th and 8th of December 2016. The 59club Directors will empower you to convert more member sales & maximise member and visitor revenue. Whilst the infamous American, Gregg Patterson, will excite & entertain as he discusses the BUZZ, the LOVE and the GLOW enlarging and enriching the service experience. Contact 59club for further information on this must attend event aimed at Owners, Managers, Directors of Golf and all aspiring future managers – come and be enlightened! The 59club ‘Sales, Service & Retention Roadshow’ brought the industry together and was hailed a huge success by all attendees. The Roadshow took place in December, beginning at Foxhills Resort and ending at Manchester United’s Football Ground. Content focused on the art of doing CLUB WELL, and included proven tactics that were guaranteed to assist clubs to convert more member sales, generate more referrals, retain more members, enhance the service experience, maximise additional revenue and retain customer loyalty. Gregg Patterson, CEO of Tribal Magic, didn’t fail to entertain and inspire the audience with his uniquely outrageous style for which he is famous! 59club Directors and PGA Members Mark Reed & Matt Roberts had the audience hanging on their every word as they each presented the industry leading 59club Sales & Service process that assists clubs to achieve Excellence. 59club have been inundated post event with discussions over how their Management tool ‘my59’ can assist clubs further. Gregg Patterson commented, “Given my perspective on 59club as a training tool, I'd like to emphasize the value of the ‘service template’ that's at the foundation of the 59Club model. My59 is powerful stuff for those who want the ‘service journey’ to be special but just don't know the specific ‘things’ that need to be done to get there”. The next 59club training day is set to take place at The Belfry ahead of 59club’s Annual ‘Sales & Service Excellence Awards’ on February 27th 2017. With the same 59club promise; to re-educate & inspire, it’s sure to draw in record crowds. The event is proudly supported by 59club’s Sponsors & Industry Partners: Club Car, CGI, Kennet, Toro, Golfbreaks.com, Tacit, England Golf, The PGA, Golf Retailing, Pro Shop Europe, Fluid productions and Colt MacKenzie McNair.